The North Carolina Community Foundation is proud to administer a number of vital scholarships to students across the state. 2015 was a big year for those scholarships, thanks to the generosity of donors in every corner of North Carolina. The following is the year in scholarships, by the numbers. NCCF awarded $730,430 in direct scholarship aid to 335 students from across North Carolina. 370 individual scholarships were awarded from 133 scholarship funds. 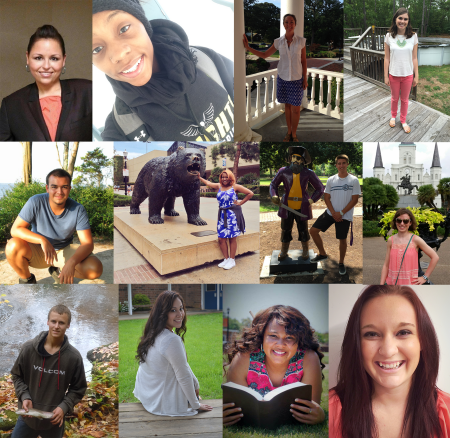 Of the 2015 NCCF scholars, 142 are first generation college students. This year’s scholars represent 141 North Carolina cities and towns, and are studying at 87 different schools in 14 states across the country. The geographic diversity of NCCF’s 2015 scholars is shown above. This year’s scholars hail from every corner of the state. Of the schools attended by 2015 NCCF scholars, 55 are in North Carolina, meaning $637,355 in scholarship dollars stay right here in our state. Scholars attended 15 public universities, 22 private colleges and universities and 18 community colleges in North Carolina this year. Shown proportionally above, North Carolina public universities received the largest share of scholarship funding at $445,143, followed by NC private colleges and universities at $149,380 and NC community colleges at $42,833. 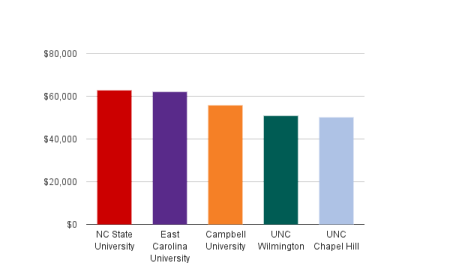 This year’s recipients of the largest amounts of scholarship dollars (shown below) are NC State University at $62,910, East Carolina University at $62,083, Campbell University at $55,790, UNC Wilmington at $50,720 and UNC Chapel Hill at $50,193. In 2015, 269 scholarships, totaling $478,295, were awarded to women. During the 2015-2016 academic year, 43 of this year’s NCCF scholars are graduating. Click here to read the stories of some of our students’ stories in this year’s scholar spotlight series.